Physalis alkekengi. From Otto Wilhelm Thomé's Flora von Deutschland, Österreich und der Schweiz 1885, Gera, Germany. Physalis L., Sp. Pl. 1: 182 (1753), & Gen. Pl. 5th edn, 85 (1754); from the Greek physallis (bladder), in reference to the inflated fruiting calyx. Type species: P. alkekengi L.
Summer-growing annuals, rhizomatous perennials or short-lived shrubs, glabrous or pubescent with simple, forked or glandular hairs. Leaves alternate, 1 or 2 per node (but not opposite), when 2 unequal in size, simple, entire, toothed or lobed, petiolate. Flowers solitary in leaf axils and stem forks, bisexual, actinomorphic. Calyx tubular to campanulate, 5–lobed, enlarged in fruit. Corolla broadly campanulate to rotate, mostly yellow, often with dark spots towards the base; tube short; limb expanded, shallowly 5–lobed, folded in bud. Stamens 5, equal or unequal in height, inserted towards base of corolla-tube; anthers bilocular, basifixed, dehiscing by longitudinal slits. Ovary bilocular; stigma capitate. Fruit a berry enclosed by inflated calyx. Seeds disc-shaped to broadly reniform. U.T. Waterfall, A taxonomic study of the genus Physalis in North America north of Mexico, Rhodora 60: 107–114, 128–142, 152–173 (1958); U.T. Waterfall, Physalis in Mexico, Central America and the West Indies, Rhodora 69: 82–120, 202–239, 319–329 (1967); R.B. Fernandes, Sur l'identification d'une espéce de Physalis souspontanée au Portugal, Bol. Soc. Brot. 44: 343–366 (1970); D.E. Symon, The solanaceous genera, Browallia, Capsicum, Cestrum, Cyphomandra, Hyoscyamus, Lycopersicon, Nierembergia, Physalis, Petunia, Salpichroa and Withania, naturalised in Australia, J. Adelaide Bot. Gard. 3: 133–166 (1981). This group remains a difficult one. See under the Key to species below for changes which have occurred since the Flora of Australia treatment. 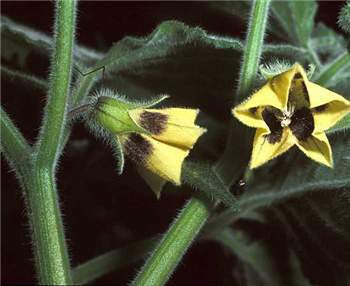 A table of comparison of species in California can be found on the California Department of Food and Agriculture site at http://www.cdfa.ca.gov/phpps/ipc/weedinfo/physalis-table.htm This table covers most of the species found in Australia. Another publication since the Flora of Australia treatment which considers hair morphology in relation to classification is Seithe, A. & Sullivan, J.R. (1990). 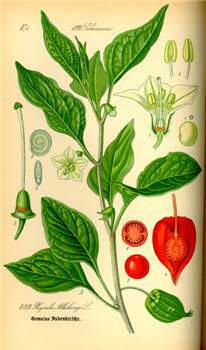 Hair morphology and systematics of Physalis (Solanaceae). Plant Systematics and Evolution 170: 193–204. Since this key was prepared there have been some changes. P. minima of the earlier flora is now treated as P. angulata and a further species, P. micrantha, has been recorded from the Northern Territory by Symon (D.E.Symon (1997). Physalis micrantha (Solanaceae) recorded from the Northern Territory. Australian Systematic Botany 10: 681-2). More recently Tony Bean has published a new key to the species in Australian Systematic Botany Society Newsletter 127 (2006). This work primarily stemmed from work on the genus in southeastern United States by Sullivan (J.R.Sullivan (2004). The genus Physalis (Solanaceae) in the southeastern United States. Rhodora 106: 305-26). As a result of his study of Queensland Herbarium specimens Bean considers P. virginiana should be treated as P. longifolia and P. micrantha described by Symon should be treated as P. minima. The genus remains difficult and it is likely that there will be further changes as further revisional and DNA studies of these weedy introduced species are carried out. The key below is the original from the Flora with some updating: Bean's key to the species can be accessed through the link given above. 6 Anthers 3–4 mm long, becoming twisted; flowers bright yellow; berries mostly 17–30 mm diam. 6: Anthers 2–2.5 mm long, straight; flowers dull yellow; berries usually 8–15 mm diam.